Idea Cellular has launched a special recharge voucher for its users in Kolkata & West Bengal. The new voucher will enable Idea prepaid subscribers to make Local, STD and ISD calls at affordable rates during the upcoming festival season, and also get more value for money. The new special recharge voucher offers more than Full Talktime, as Idea is now offering Rs. 42 worth of Talktime on a recharge of Rs. 35. Idea users in Kolkata and West Bengal can avail this offer and can recharge with the new voucher which will also enable them to make Local and STD calls at just 40 paise/min. Talktime validity is for 7 days from the day of the recharge. 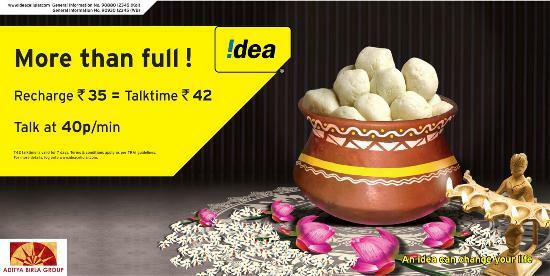 Idea has also introduced similar offers for its large base of users in the entire East region, covering Assam & North East, and Orissa, besides Kolkata & West Bengal.